Harley Davidson Motorcycles can be very expensive bikes to buy. The best way to protect this investment is by doing regular maintenance on them. To do this, you will need a good motorcycle jack to lift the bike off of the ground. Read on to see our list of the best motorcycle lifts on the market. Performing regular maintenance on a bike can be almost as fun as riding the motorcycle. Great satisfaction can be gained from successfully tinkering on your bike, maintaining, and upgrading it. Plus, it is nice having peace of mind while riding a well-maintained bike, that it is less likely to break down. On the other hand, it can be very frustrating woking on a motorcycle without having the right tools. Not only will it take you way longer, it can be dangerous. One of the most essential tools for basic motorcycle maintenance is a jack. Having a jack will allow you to Lift up the bike, which will make it easier to change the oil, remove wheels, and get to hard to reach places. But a jack for a Harley is a specialty item. You can’t just use a bottle jack to raise your bike, and using a portable car lift is really overkill for the job. The best bet is a jack that is specifically made to use with bikes, and in in this case one that is well suited for Harley motorcycles. When searching for a motorcycle lift, you want to make sure that it is able to lift the weight of your bike, is durable, and safe. All of the motorcycle jacks we mention in this list meet all of those criteria. They are safe units, with a high weight capacity and are made with durable materials. Click the buttons above for detailed information about each unit, or read on for our review of each of the top 3 motorcycle lifts. Our top choice for the best product in this review is the PowerZone 380047 . This motorcycle jack has exceeded our expectations as it has better features and quality than any other product in its price range. The lift is strong, with a maximum capacity of 1,700 lbs. Which is strong enough to lift even the heaviest of Harleys. The Powerzone motorcycle jack is designed with tons of features, not only being ultra-convenient, but extremely safe as well. This model has a hydraulic pump that is operated by foot, which leaves your hands free to stabilize and position the bike. A nice safety feature included with this lift is a safety lock, which will prevent injury and damage to your motorcycle. To further protect your Harley, the jack has rubber grip pads that prevent damage to the frame of the bike. After your done using it, the Powerzone conveniently folds to under 5 inches for easy storing. 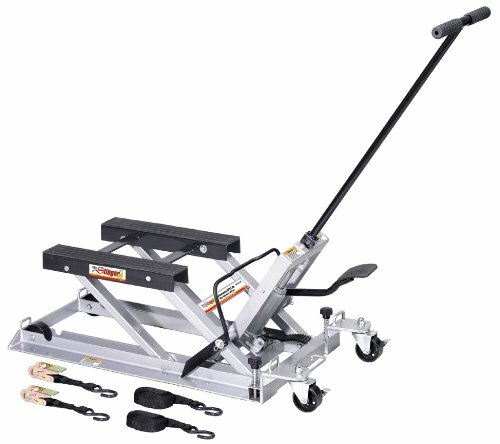 This motorcyle jack is the best rated model out there, with over 300 four and five star reviews. Product reviewers overall had great things to say about this jack. One person said it is a “great jack for a great price.” Not only is the Powerzone the best motorcycle lift on the market, it can also can be aquired at a stellar price. Rated Capacity: 1700LB. Lifting Range: 4-1/2" to 14-1/2". Heavy duty steel construction is built to last. 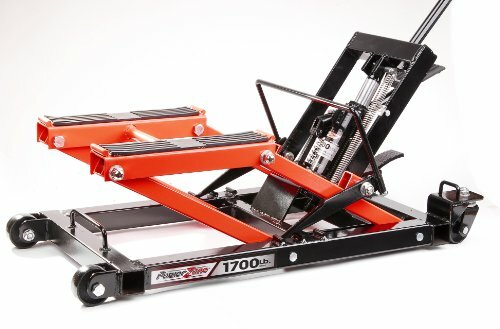 The 2nd best option in our roundup of motorcycle jacks is the OTC 1545. This High quality jack is an excellent choice for those who want a durable product without worrying about it breaking or having to replace it. Beyond being built with highly durable materials, this jack is sold with a two year warranty, so you can have peace of mind that it will last. The OTC Motorcycle Lift is almost as strong as the Powerzone jack, being able to lift up any motorcycle under 1,500 pounds. It is designed with an ultra-low profile, allowing it to fit under 3.5 inches. Beyond this, the excellent design also includes a removable handle, allowing you maximum access to work on your bike. Also included is a set of 360-degree rotating rear castors with a foot pedal lock. Finally, a set of safety straps are included to help secure the bike even more safely. Just like the Powerzone, the OTC 1545 Motorcycle lift is a highly rated product. With an average of 4 stars, users of this jack had great things to say about it. Overall, the OTC jack is an excellent product, all though it is somewhat pricey. The final item in our review of motorcycle lifts for Harleys is the LiftMaster 6230. This jack is the most affordable product that made this list list, but that by does not mean this isn’t a great product. If you spent most of your cash on your bike and don’t have much left to spend on a motorcycle jack, this is the one for you. The LiftMaster is very similar in design and features to the other to lifts mentioned in this review. Like the other two, it will lift any bike you need, with a 1500 pound weight limit. At the lowest height, the clearance for the jack is 4.3 inches. At its highest point, it will lift a motorcycle to 14.5 inches off the ground. Like the other two models, this unit has swivel castors and a foot release valve. The low price of the jack may have you concerned about quality or safety, but the LiftMaster is CE/ANSI certified, meaning it meets certain product safety standards. Although this product is not as highly rated as the other two, product testers still had good things to say about it. Some of the comments were things like “works great”, “well satisfied”, and “not bad for the money”. Overall, this is a decent jack that will get the job done, and the crazy low price makes it even more attractive. Motorcycle jacks are an essential tool for any motorcycle junkie. 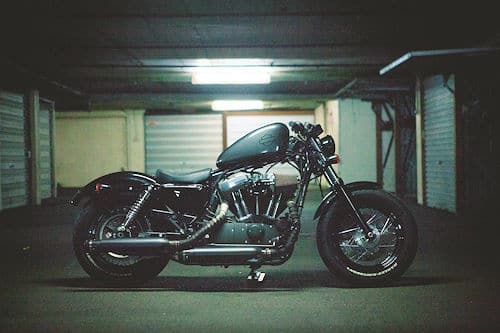 Many bikers prefer to handle services, cleaning, and tune-ups on their own, as it saves them money and can even turn into a hobby itself. Before anyone buys a motorcycle jack or begins working with one, it’s important to know what they are and how they are used. Here’s a quick guide. A motorcycle jack is a piece of equipment used to lift up a motorcycle from its original resting height into an elevated position in order to make it easier to work on. These jack tools use a power source of either hydraulics, compressed air, or a mixture of the two to lift the bike up. Certain jacks are designed specifically for certain kinds of bikes or particular needs. Some provide mobility with wheels on the bottom, and others are stationary jacks. These jacks are used to service motorcycles by making access to the bike easier. The lift design makes it easy to adjust without the physical strain of lifting the bike up. When a jack has wheels, it is easy to move around so that it can be put back into storage when the rider or mechanic is finished with a servicing session. Bikers tend to enjoy doing their own repairs to bikes because of the cost saving and pure enjoyment of the labor. 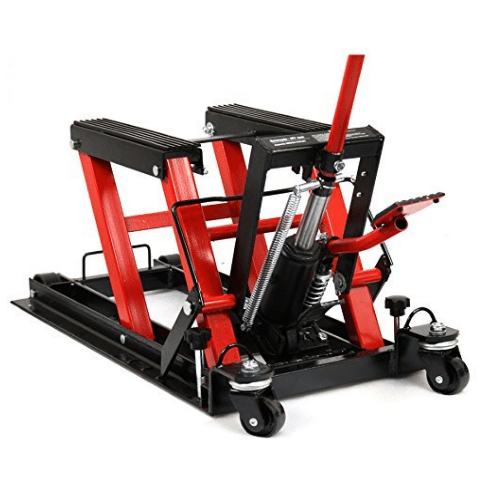 Commonly, a motorcycle jack consists of the following parts: a wheeled foundation, a large flat platform that is mobile both upward and downward, and a power system. It’s important to make sure whichever jack is being used has a lift capacity that is at least 50% greater than the weight of the bike. This will make it easier to lift. Be sure to lock the wheels in place, if the jack has them, before beginning to lift. Straps or blocks of wood to aid in balance are also a good idea to keep the bike in place. Once balanced, simply jack the bike up using the lever until it’s up in the air. It’s important to remember a few things before operating the jack, as it could cause serious damage to the bike or potential injury to the operator. Firstly, the jack must not be overloaded or it could give out. It’s also key to line up the bike to the appropriate lifting points identified by the jack. Maintaining a safe distance away from the pinch points of the jack will keep fingers safe. Lastly, if doing work that requires sitting on top of the bike while on the jack, ensure it is stable before placing weight on the bike. 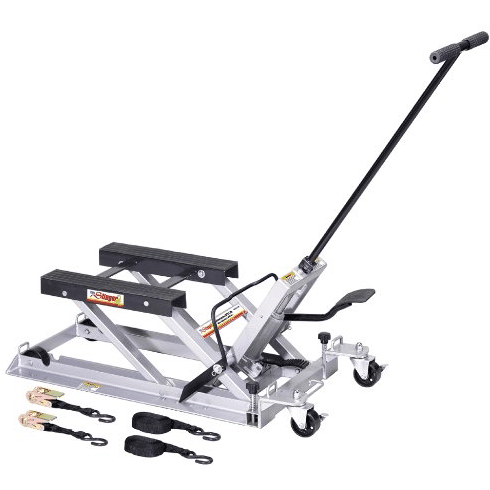 Motorcycle jacks are specifically designed to lift motorcycles and some ATV 4-wheel vehicles. They are smaller than car jacks but larger than bottle jacks. A bottle jack is essentially just the lifting mechanism without the platform or other parts. 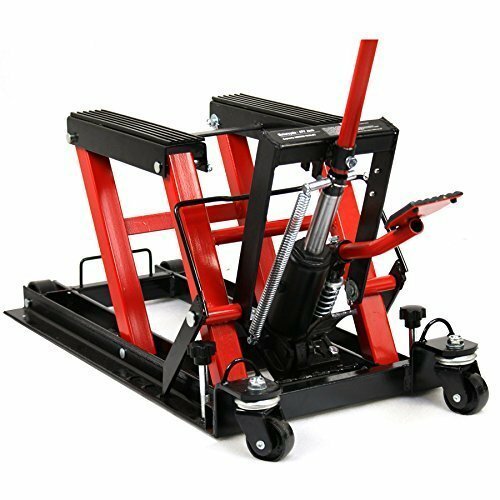 A motorcycle lift has a lifting platform and other components that work with the type of vehicle body. These jacks have a section that holds the back of the bike securely to ensure it can be worked on from an elevated height without rolling backwards.